War wirklich das Anhoeren wert, auch wenn mir ausser "Silver Lining", "Blowin' Smoke" und "Follow Your Arrow" die Songs ein bisschen zu ruhig/"lieblich" sind. Gerade bei dem vielversprechend melancholischen "Merry Go 'Round" aergert es mich regelrecht, dass mir das Lied musikalisch ein bisschen zu zahm ist. A really pretty debut album from one of the most promising country stars from the last few years. 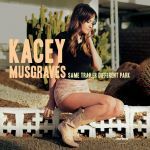 Kacey is pure country, there are very few gimmicks here that would cause someone to expect this to crossover into the 'pop' domain, but the boldness of her lyrics make her stand out from many of her contemporaries. Merry Go Round and Follow Your Arrow are both songs that deal with the underside of small towns, something that country music rarely ever does. The fact that it's coming from a female who, at the time of release, was under 25, is even more surprising. I've always enjoyed most country music, and this is a very good listen. 4.7/6.